Direct costs: These costs can be clearly identified with each unit of production. Indirect costs: Costs that cannot be identified with a unit of production - also known as overhead costs. Fixed costs: Remain unchanged no matter what the level of output, such as rent of premises. Variable costs: Costs that vary with output, such as purchases of flour at a bakery. Semi-variable costs: These include both a fixed and a variable cost element, such as a salesperson's fixed basic salary plus a commission that varies with sales. What is revenue? An organizations revenue is income that it receives from its usual business activities such as the sale of goods and services to customers. This is calculated by the price of each product multiplied by the amount of each product sold. What are different revenue streams? The income that organizations receive from a particular business activity. Most businesses will have more than one revenue stream. 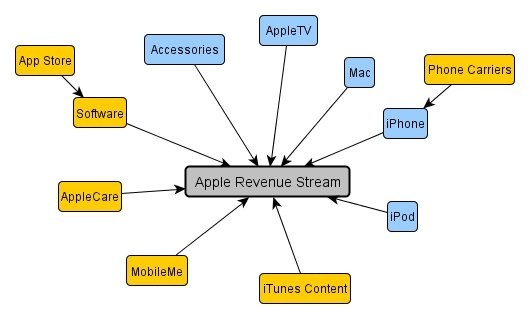 For example, Apple® has multiple revenue streams from a wide range of goods (iPhones, iMacs, iPads, Apple TV, etc), services (iTunes, MobileMe, Apple Care), software (including Apps) and investment income (interest on vast cash holdings, dividends and profits from equity holdings and subsidiaries).